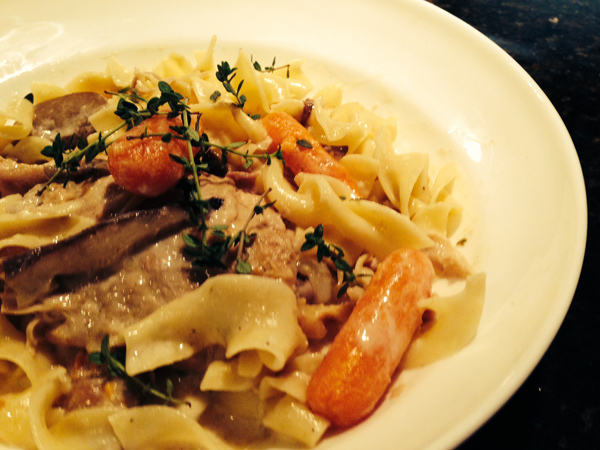 Chicken Fricassee is one of those timeless classics that never goes out of style. Traditionally made with chicken pieces on the bone, I have changed my recipe to use boneless, skinless chicken thighs. It cooks quickly and the meat is always tender. In addition, a piece of boneless chicken makes a nicer presentation when entertaining. While you can serve this dish with a mashed potato or even rice, my family loves it with buttered egg noodles. They absorb the sauce and really enhance the comfort food aspect of the dish. Begin by seasoning the chicken on both sides with salt and pepper. Heat a Dutch oven over medium heat with the butter and the olive oil. Working in batches, dredge the chicken in one cup of the flour and shake off the excess. As you coat the chicken drop it into the butter/oil mixture in a single layer. Do not crowd the pan! Sauté the chicken until brown on both sides (this takes about 10 minutes). Once the first batch of chicken is cooked, transfer it to a plate, and repeat the process with remaining chicken. Remove all the chicken from the pan and reduce the heat to medium low. Add in the onion, shallot, carrot and celery and stir. Let the vegetables cook until they are softened (about 8 minutes). Add the mushrooms, turn the heat up to medium high and let them cook, stirring occasionally, for another five to seven minutes. The mushrooms should be caramelized and golden in color. Stir in the two tablespoons of flour and cook (while continuing to stir) until the flour has evaporated. Add the wine and scrape all the brown bits from the bottom of the pan. Let the wine simmer for about 60 seconds. Add the chicken back into the pan along with any of the accumulated juices. Pour in the chicken stock, parsley, thyme and bay leaves and stir. Cover the pot and simmer gently for thirty minutes. When the thirty minutes are up, beat the egg yolks and heavy cream together, turn the heat to low, and quickly pour the mixture into the pan while stirring vigorously until it is incorporated. Bring to a simmer for five minutes. Spoon the chicken, vegetables and sauce into a bowl and garnish with more fresh thyme sprigs. Serve with buttered egg noodles. The Elegant Occasion Note: This dish can be completely cooked 24 hours in advance and reheated gently the next day.